Bitterroot, or Rock Rose It's not unusual to see a rocky outcrop or gravelly patch of ground covered with these flashy members of the purslane family and Montana’s state flower. Their fleshy fingerlike leaves, just an inch or so long, emerge out of nowhere as soon as warm weather arrives. When the buds appear, the leaves withdraw, and as soon as the blooms wither the whole thing disappears underground. We’ll just have to guess where they’ll come up next spring. Indians peeled and boiled the roots, but only early in the season – as they age, the roots become bitter. Desert Parsley This plant has an edible root. Its leaves have a strong, parsely-like flavor. Not to be confused with parsley desert buckwheat. Yellow Desert Paintbrush Most of us think of desert paintbrush as being that much-loved flaming vermillion color, but paintbrush comes in yellow, too. Orange Globe Mallow Conspicuous in the sagebrush, this desert-loving relative of the hollyhock and hibiscus is making a big splash this year. Old Man's Beard, Revisited Our previous story on Wildflowers of the Sagebrush Steppe had a photo of a flowering old man’s beard. 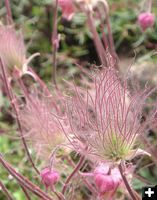 This is the fruiting stage of the plant, showing the feathery strands designed to catch the wind and carry the seeds to new territory. Plains Daisy Prevalent in the dry, thin, rocky soils of Wyoming’s steppelands, the plains daisy turns a barren landscape into a rock garden. 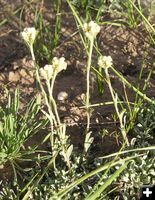 Pussytoes, or Everlasting Common in the sagebrush plains, everlasting (also called Pussytoes due to its fuzzy, rounded flower) can also inhabit high-elevation forests. 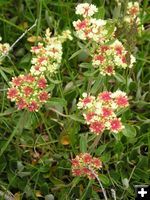 The flowering stalks last a long time (duh) and are nice in flower arrangements. Stonecrop Also known as sedum, this is a summer blooming succulent, so in Pinedale we should be seeing more of these in the coming weeks. Umbrella Desert Buckwheat In our earlier story, we noted that the many species of desert buckwheat constitute a very large part of the plant population on the sagebrush steppe. 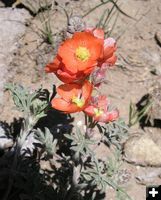 This variety is most common in the Great Basin and Colorado, and enjoys a wide variety of habitats. 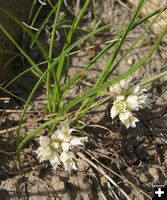 Wild Onion Yes, it’s common. But isn’t it nice to know there’s always something at hand with which to season our deer or rabbit stew? Cryptantha Annual, biennial and perennial cryptantha are present in our area. 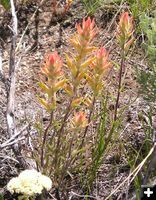 These inconspicuous plants with soft, hairy leaves shelter at the base of sagebrush, and are quite beautiful close-up.